Leicester prop Martin Castrogiovanni will lead Italy in the absence of banned number eight Sergio Parisse for Saturday's Six Nations game with Wales. Stade Francais' Parisse is out of the tournament after being suspended for 30 days for insulting a match referee. Manoa Vosawai comes in at number eight amid four changes to the side that lost 34-10 to Scotland in the last round. Kristopher Burton and Edoardo Gori form a new half-back pairing, with Antonio Pavanello at lock. Burton takes over at fly-half from Luciano Orquera, who starred in their opening win over France in Paris, while Tobias Botes loses his scrum-half spot to Gori. Orquera and Botes drop to the bench as coach Jacques Brunel seeks an improvement on their showing at Murrayfield on 9 February. "It's a really big responsibility to get into Sergio's shoes - they are big shoes to fill," Vosawai said. "This is something I'm really looking forward to. It's a great opportunity for me." Castrogiovanni will lead the Azzurri while winning his 94th cap. Parisse was sent off in Stade Francais' French Top 14 game against Bordeaux-Begles last Saturday and will miss Italy's matches against Wales, England and Ireland. 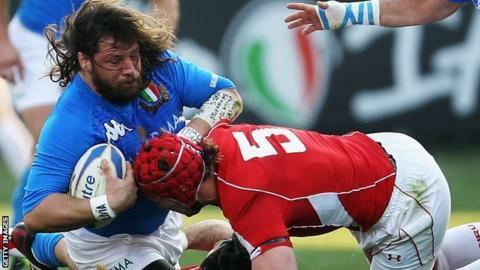 However, the captaincy is not new to Castrogiovanni, having led Italy in their 2012 Six Nations game against Scotland. Italy have beaten Wales on two previous Six Nations occasions in Rome - in 2003 and 2007 - and it will be the countries' first championship meeting at Stadio Olimpico. Andrea Masi (Wasps); Giovanbattista Venditti (Zebre), Tommaso Benvenuti (Treviso), Gonzalo Canale (La Rochelle), Luke McLean (Treviso); Kristopher Burton (Treviso), Edoardo Gori (Treviso); Andrea Lo Cicero (Racing Metro), Leonardo Ghiraldini (Treviso), Martin Castrogiovanni (Leicester, capt), Antonio Pavanello (Treviso), Francesco Minto (Treviso), Alessandro Zanni (Treviso), Simone Favaro (Treviso), Manoa Vosawai (Treviso). Replacements: Davide Giazzon (Zebre), Alberto De Marchi (Treviso), Lorenzo Cittadini (Treviso), Quentin Geldenhuys (Zebre), Paul Derbyshire (Treviso), Tobias Botes (Treviso), Luciano Orquera (Zebre), Gonzalo Garcia (Zebre).